Posted on May 27, 2011 October 16, 2016 , in Cleasby Conveyors, HIAB Crane, HIAB Method Magazine, Mixveyor Concrete Conveyors, Moffett Truck Mounted Forklift, Multilift Hooklift. 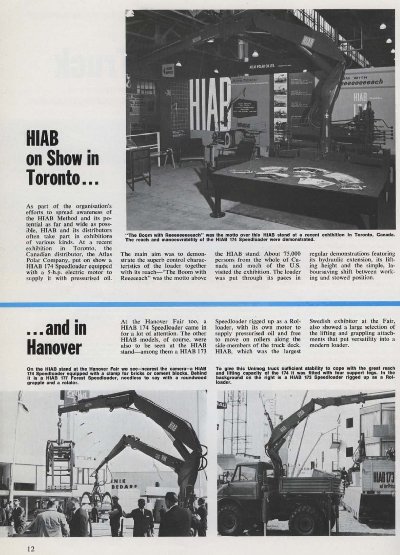 Seeing Atlas Polar and a bevy of HIAB cranes at provincial and national trade shows is a regular occurrence today but how about back in 1967? The seventh edition of HIAB Method magazine highlights a trade show held in Toronto at which Atlas Polar “put on show a HIAB 174 Speedloader equipped with a 5-h.p. electric motor to supply it with pressurised oil.” The show was attended by about 75,000 people from across North America, who saw the “Boom with Reeeeeach” put through its paces in live demonstrations of the crane’s many capabilities. You’ll continue to find Atlas Polar at many industry-specific trade shows in landscape, construction, general cartage and more, meeting with customers and suppliers. Today we not only show the full range of HIAB knuckleboom cranes but also the many other products we have to offer: Moffett truck mounted forklifts, Multilift hooklifts, Mixveyor concrete conveyors, and Cleasby roofing conveyors. Stay tuned to our blog for information about upcoming shows we will be attending.